Some communications channels come and go (think MySpace and Vine) but theatre--and the tradition of the high school play--are both alive and well. 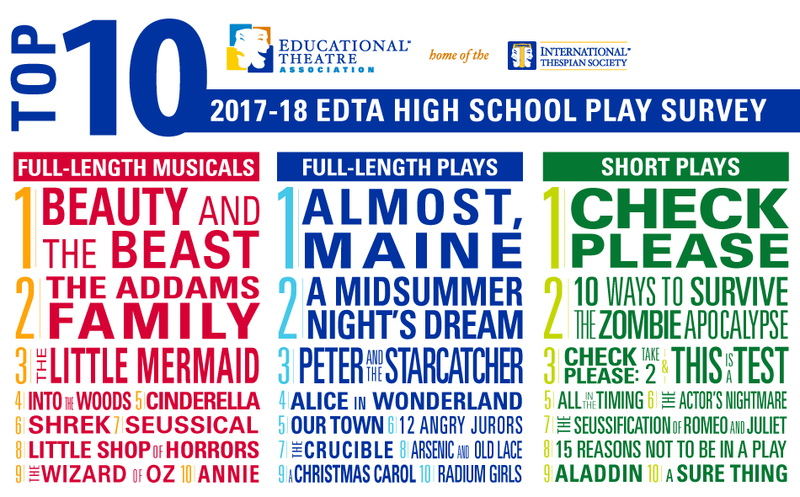 According to EdTA's annual high school play survey, Beauty and the Beast; Almost, Maine; and Check Please clinched top billing for most produced musical, full-length play, and short play, respectively, during the 2017-18 school year. Communities partake of high school theatre on a regular basis. 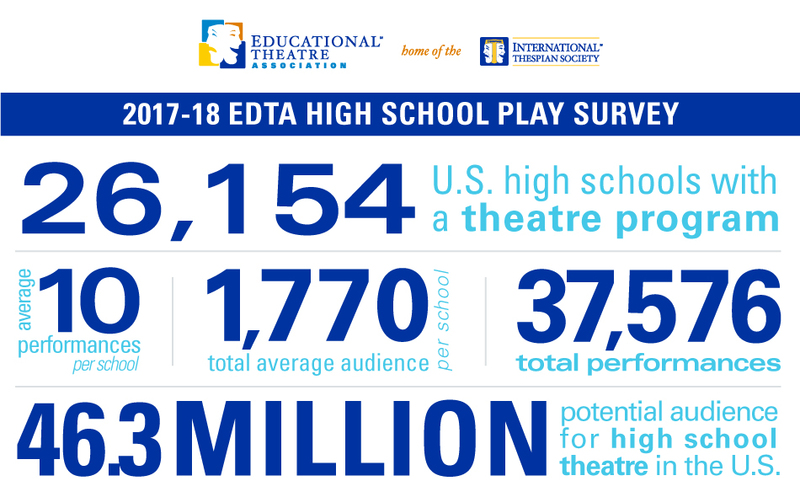 Last year EdTA expanded its exclusive play survey, now in its 80th consecutive year, to include not only data on which plays were produced in America’s high schools but also on how many people came to see them. This year nearly 4,000 schools responded to the survey and reported presenting an average of 10 performances each last year, with a total average audience of 1,770. Extrapolating these averages to all schools with a theatre program yields a potential audience of 46.3 million for high school theatre across America, comparable to the combined audiences for Broadway touring companies and regional theatres. John Cariani, the author of Almost, Maine, which has been the most-produced full-length play for four consecutive years, and who is currently in the cast of the Tony Award-winning play The Band’s Visit, will be giving a keynote address at the EdTA National Conference in Denver in September. National Public Radio compiled seven decades’ worth of survey results into an interactive database, which can be found at npr.org. This week they will again update the database to include the current results.